Lock in a great price for Nook Dee Boutique Resort, Kata Beach by Andacura – rated 8.4 by recent guests! The room was so cute and clean. Beautiful view from pool was perfect. I was really relaxed at this hotel. Great views overlooking Kata Beach and Kata Noi. Roof top bar is a great place to watch the sunset. (You can go to the bar without being a guest.) The room was well appointed and comfortable. EVERYTHING! Staff were amazing and friendly. Very nice design & infinity pool with ocean view. Away from all the town noise. Room was great, with good AC. The Sky Bar was nice, with beautiful sunset panorama. Breakfast was great and had a good selection to fit everybody’s tastes, and you can also enjoy the view when having breakfast. All of perfect! Pool is the best, staff, breakfast with beautiful sea view! Employee helped all of time about everything! Thank you!!! -The room, the design is remarkable and nice - the pool is also adorable, the view is just breathtakingly. Rooms are lovely - very comfortable bed, beautiful bathroom and lovely views. We had a very pleasant stay. Very polite and helpful staff. Amazing sunsets’ views from pool and terrace. Very clean rooms and relaxing atmosphere throughout the resort. Lots of choices for breakfast. Will return, thank you! Nook Dee Boutique Resort, Kata Beach by Andacura This rating is a reflection of how the property compares to the industry standard when it comes to price, facilities and services available. It's based on a self-evaluation by the property. Use this rating to help choose your stay! Located about 2,100 feet from Kata Noi Beach, Nook Dee Kata Beach is a Thai-style boutique hotel offering an outdoor pool, spa and wellness center and a restaurant. During the stay, guests can also take advantage of the sun terrace, a fitness center and free WiFi. Featuring stunning views of the Andaman Sea, each Thai-style guestroom features a full-length sliding glass door, which opens to the private balcony. All units are supplied with a flat-screen cable TV, a sofa and a dining table. An electric kettle, a mini-bar and coffee machine are standard in all rooms. Every private bathroom comes with free toiletries. For additional convenience, Kata Beach Nook Dee provides a 24-hour front desk, laundry and luggage storage services. The hotel has meeting facilities as well as fax/photo copying. For guests who drive, on-site parking space is available free of charge. Jungceylon Shopping Center and Bangla Road can be reach within 8.8 and 0.7 mi respectively. Outdoor enthusiasts can head to Kok Chang Safari Elephant trekking (0.7 mi). Phuket International Airport is 21 mi from the property. A range of local and international cuisine can be enjoyed at the hotel's restaurant. Alternatively, you can also find more dining options under a 10-minute walk from the property. When would you like to stay at Nook Dee Boutique Resort, Kata Beach by Andacura? Boasting a private balcony, this twin/double room features a flat-screen cable TV, a sofa and a dining table. A mini-bar and an electric kettle are available. Its private bathroom comes with a shower and free toiletries. Offering a private balcony, this double room is fitted with a sofa, a dining table and coffee machine. Guests can enjoy cable channels on the flat-screen cable TV. A mini-bar and an electric kettle are available. 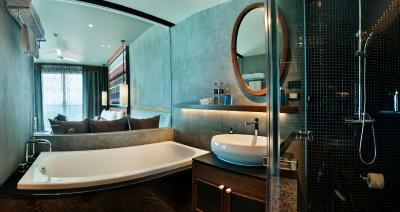 Its private bathroom is supplied with free toiletries and a bathtub. Welcome to the elegant and charming Nook Dee, a boutique resort in beautiful Kata Beach, Phuket, featuring amazingly Thai designs and stunning views to the ocean below. With its intimate setting and warm Thai hospitality, Nook Dee Kata Beach Resort is the ideal accommodation for weekend trips with friends or romantic getaways for couples. Indulge yourself with pampering treatments at our relaxing spa, savor authentic Thai cuisine specialties and creative cocktails at our Roy Dee restaurant, or if it’s time to party, celebrate your special event in style. The most charming spa resort in Kata Beach awaits you. The charming Nook Dee Boutique Resort rests high above beautiful Kata Beach, and presents dramatic ocean views that drift out as far as the eye can see. Luxuriate in an intimate setting perfect for couples and holiday-makers looking for a cultural resort defined by personalized and warm, Thai hospitality. Nook Dee offers a unique experience with exceptional boutique rooms designed to allow guests the opportunity to enjoy authentic Thai-style accommodation and authentic lifestyle. House Rules Nook Dee Boutique Resort, Kata Beach by Andacura takes special requests – add in the next step! Nook Dee Boutique Resort, Kata Beach by Andacura accepts these cards and reserves the right to temporarily hold an amount prior to arrival. WiFi was worst in our room and we had problem with air- conditioning, we can’t sleep all night! The bed was rock hard neither of us had a good nights sleep for the full 7 nights. We woke every day with either a sore neck, shoulders or back. If you are a side sleeper avoid. Only 2 bottles of complimentary water was not enough. The hotel was 3.5-4 stars not a 5 star hotel. - You are starting with a lack of trust, we need to pay a deposit to them 😏 and at the end they will return this amount to you, but the procedure itself is not likely. - the breakfast was the same, without any changes, during all our stay, but was tasty - prices are very high comparative to the city :food, massage, etc. Pool is not safe, because there are no barrier on all sides. That’s why it’s possible to fall from pool down some 3-4 meters. View from the window and from the pool, good personal, clean room, very comfortable bad.